Start off by placing roughly 2-3 cups of fatback at the base of your large palayok. 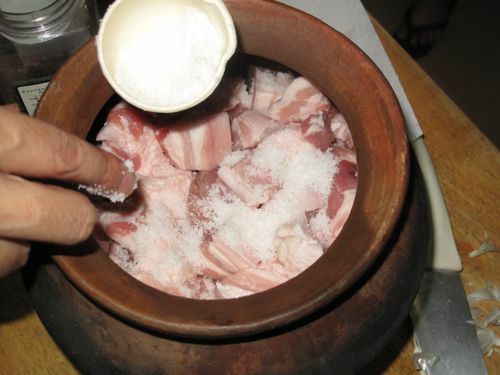 This will melt as the pot heats up, providing a pool of lard that eggs on the rest of the fat to melt gently. 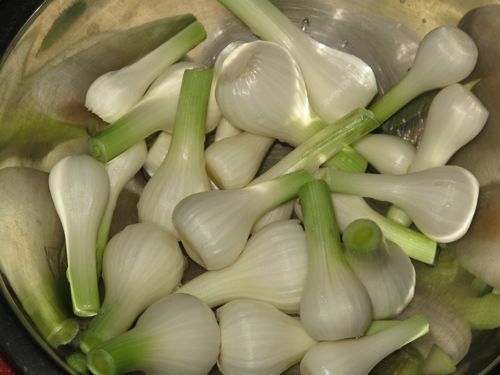 If you find young garlic bulbs in the market, snap them up, clean them and just shave the roots off, so that the bulbs remain whole while cooking. These have a mild garlic flavor, that turn fabulously sweet when cooked for a long time. 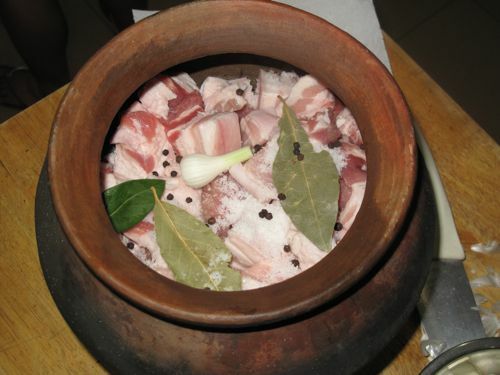 Add some whole garlic cloves, young garlic over the fatback and place about 1 kilo’s worth of cubed fatty pork liempo. 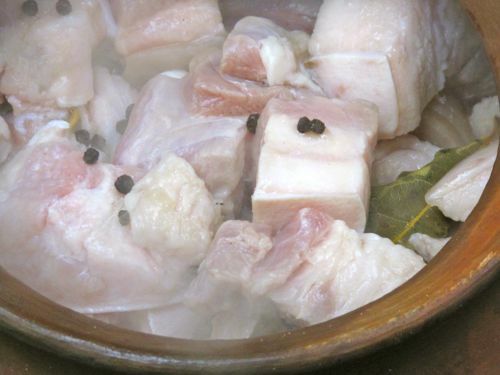 Add some of the 1/3 cup total of rock salt or slightly less kosher salt on top of the pork, some of the whole peppercorns, fresh and dried bay leaves and more whole baby garlic before another layer of pork. The third layer should bring you close to the top of the palayok. If it’s still roomy, scale up your recipe and try four kilos next time. Pour in a cup of good coconut or sugar cane vinegar and I sometimes add 1/3 cup of water to prevent sticking at the bottom of the pot. Place your palayok over a raging wood fire until the liquids inside start to boil and the acid of the vinegar burns off. Lower the fire after a few minutes of boiling so that the pot merely gurgles along. You may cover it now. For the next 2.5-3 hours, you merely have to visit it to tend the fire and ensure a relatively steady low flame. Thank you for the recipe MM. But what can one use if one doesn’t have a palayok? 3.5 hours!? Truly a labor of love! It’s way past my bedtime here and I am still awake coz, masakit stomach ko after eating left over grilled chicken with mushroom sauce on top and grilled potatoes.. masarap, kaso nakakasawa..eto busog na hindi naman satisfied. To unwind, I opened your site. and, here it is… adobo… wahhhhhh, I am drooling. I look forward to the weekend, so I can cook this. I got a charcoal cooker, pero ala akong palayok.. I might have to buy it in the Vietnamese store…Wahhh.. pahingi.. pahingi…. Lalo ako nitong hindi makakatulog.. baka mapaginipan ko pa itong adobo.. Delicious, MM! The woodfire, the palayok..if only I could duplicate your setup over here in Van. I’ll just have to make do with my trusty slow cooker. YES to leaving out the soy sauce. Actually, when fried again, it gets a nice caramelized golden brown color so it is more a “tanned adobo”… :) emsy, oddly, after hours of cooking, the natural umami of the pork emerges, and the soy sauce like salty hit is there without the soy sauce. For short cut versions meaning cooked for only a few minutes, yes the soy sauce helps. Lou, try it in a heavy casserole or enameled pot in a low heat oven for several hours. Or in a barbecue with wood chips for smokey aroma. Anne, sorry I don’t know the Filipino word for fatback, but I suspect the butchers will know what you are seeking if you ask for that…chreylle, it won’t be exactly the same as cooking on a wood fire, it will lack that essential aroma, but this can be done in a heavy pot in a low heat oven for many hours as well. bearhug, a le creuset dutch oven will work in the oven. 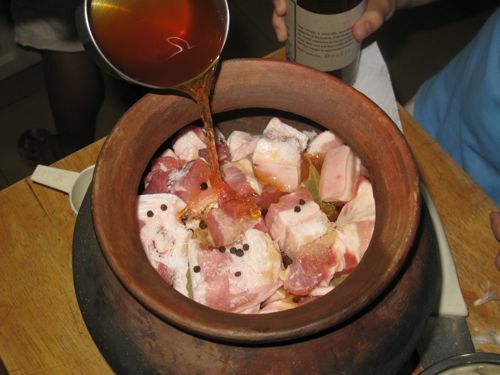 Hi MM, I think that you may have mentioned this before but in Kulinarya (collection of recipes by various writers) there is one for Adobong Puti which has NO soy sauce just white vinegar – I use white or red wine vinegar if possible. Frankly it’s a great hit and for those worried about not using Soy sauce and / or with no Palayok then refer to this. The flavours are great and not overpowered by the salty Soy sauce and this is our households go to recipe for pork or chicken adobo. Mind you, inspired by your piece above I am just working out how to use a Palayok in the kitchen of our Condo without causing collateral damage!! Perfect!!! Thanks MM . Definitely, it’s labor of love after hours of preparation. I hope I can create the same taste as how you describe them in your blog. I’m now very excited for weekend! Can I also cooked it using wooden charcoal? I have been making this since the first ultimate post came out. Definitely a winner! 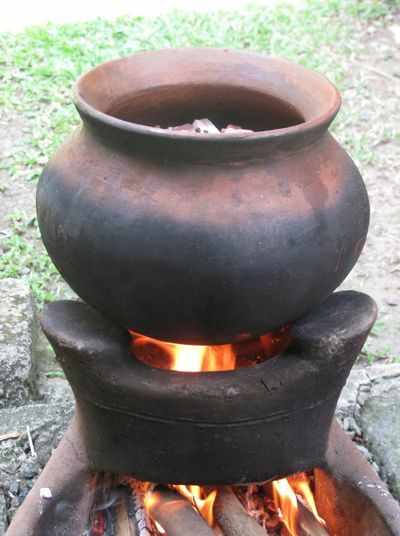 No palayok of course so just a big heavy pot over a very low fire. I think I don’t get the same moisture loss like from a palayok but still a big winner of a recipe. I then wok fry it or deep fry it. Yummy. Yes, it’s adobong puti… this is what my mom used to cook when I was little.. did not know then that adobo with soy sauce existed… lol!! Although I boil the liempo until it’s falling-off-the-bone tender and then fry the meat before adding back the reduced broth/sauce… yummy!!! we call it adobong puti (no soy sauce) or adobong matanda (cooked by those wise and wonderful cooks, our grandmas and grandpas who were taught by their own parents and grandparents). Adobo can really be made without soy sauce and it really has a distinct flavor. My Mom used to cook adobo this way. Thanks for posting this, Markerman! Now, all I need is a claypot. Have never tried cooking in a palayok, do you need to prep it like you do a wok so that it won’t crack. And if you cook in the palayok can you place it over a gas stove? This looks and sounds awesome! I have no “outdoors” in which to build my wood fire (sigh) but I do have a palayok (more than one actually)! So I will try this on my gas hob as you suggest (I’ve already tried pinakbet this way). With all the pork, fat, salt, and slow-cooking this sounds like exactly my type of dish! Tried this recipe (sans young garlic bulbs) but used a non metallic pot over a regular stove. The best adobo I’ve ever had. And yes, no soy sauce needed at all. I let it sit in a jar for a few days for all the flavors to marry and then pan fried them in its rendered fat. Ridiculously good. I would assume cooking over coals would produce an even better smoky flavor but I have to find myself one of those stoves and an extra large palayok. Where to look for these MM? this is a testimonial to the “no soy sauce added” adobo. Also cooked it in a regular wok, at the lowest heat setting, and for “just” an hour and a half instead of 3.5 h (hey, it was dinnertime already, what could i do?!) – wife says it was the best adobo she’ ever tasted! Ha! as far as i know, backfat is called “tabang tigas” in tagalog, but many butchers already seem to know what backfat means. The iconic Adobo has to be stored in a glass garapon :) Tupperware and other forms of packaging just won’t do. Adobo in a garapon reminds me of the travelling from Bacolod to Manila by sea when I was younger. Adobo in a garapon, big plastic cans of assorted biscuits, and a box or two of Dunkin Donuts purchased at their little outlet by the gangplank are strong visual pegs of boat travel we did ages ago. i too remember the adobo in glass garapon when we moved from iloilo to roxas city. MM, any suggestion with cooking this in an electric stove? “a pool of lard that eggs on the rest of the fat to melt gently” – poetry after my own heart, literally! as if the rest of the fat needed egging on…what the awesome turn of phrase did was egg me on to salivate! Funny, but the fatback you mentioned is always termed as CHIPPY in Bulacan. I have friends who make chicharon and that is what they call it. =/ Probably because it looks like it when fried. may kaibahan po ba sa magiging lasa if i cook it in stove and in sauce pan instead of palayok?ask ko lang po? Would a slow cooker also work well with cooking adobo? Perhaps it won’t have the same smoky, earthy taste of the palayok and burning wood, but would it work out just the same? That looks great! But I admit, I’ve never had a traditional adobo without soy sauce. Thanks for the post MM. will try this over the weekend.just one question though, how long can i store it? does it need refrigeration? Wow that looks good! I was actually surprised that it didn’t have soy sauce…. I must try it! btw, those green garlics are also good sauteed with some fatty pork and tomatoes. 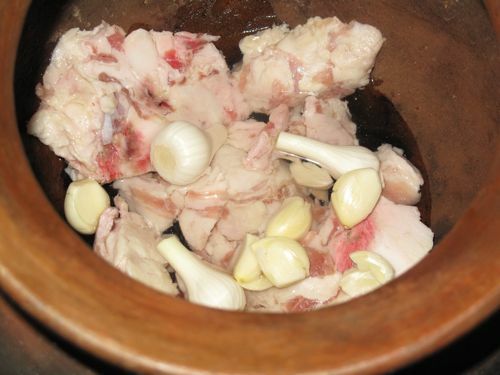 It’s an Ilocano recipe, very mild flavor and good for lowering cholesterol! GJO, fennel is different. Young garlic (although I think the proper term is green garlic) is the garlic version of green onions. My dad cooks Adobo without soy sauce as well…and you really make me hungry in the middle of my shift while reading this blog MM. Hi there, MM! Tried this the first time out without the young garlic bulbs and it was good, EVEN BETTER after frying it. The next time around, I’ll try this on the grill to get that smokey aroma, too! Thank you for posting this! Adobo with sinangag!! sarap!! Like you my Lolo (God bless his soul) likes his adobo w/o the soy sauce. He gets upset when our cook adds soy sauce to his adobo. yay! I make mine w/o soy sauce too, I use patis and 2x cooked. I fry the pork til golden brown and add in the sauce and I sprinkle fried garlic on top. I do that when I have time. gutom na ako! lunch break!! Hi MM! If I were to go to a butcher here in SF, do I just ask for fatback? Are they going to look at me funny? 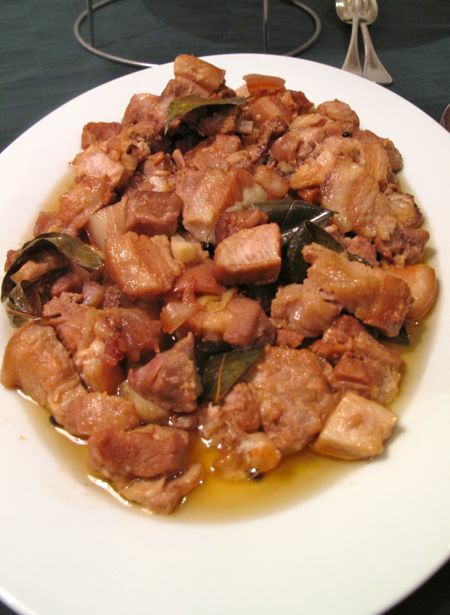 Also, is liempo side pork or belly? I want to get the meat from a butcher because i find the meat from the Asian markets “langsi”, but I want to make sure I ask for the right one. Thanks! I’ve tried your recipe before using a Le Creuset pot, Marketman, and with huge success! We managed to keep the cooked adobo in a garapon just out on the counter and finished about 3 pounds of the fatty goodness in a week. Pakonti-konti lang, hehe. What I don’t see but hope is hidden under the pile of pork cubes are those small bits/threads of meat that break off the ends of a larger piece and toast at the bottom of the palayok absorbing the flavors of the dish. I forage and root through the serving dish in search of these nuggets whenever faced with a stew. Am I the only weirdo who does this? Hi MM. This was how we cook our adobo in Batangas. Yes no soysauce. Purely salt, whole peppercorn, garlic and good vinegar. Then for color, we add atchuete oil. You may try to add unripe papaya too. Sarap…. Thanks, for the recipe MM. Can’t wait to try your recipe! MM, I think it has something to do that this adobo (as translated in the Luzon version), really comes with soy sauce. But us from the South, the one with soy sauce, is the HUMBA. Growing up, my own definition of adobo is your cooking (without the vinegar though), and the “adobo” more known in the Luzon area is actually humba esp. in the Vis-Min areas. Maria, just ask for fatback, they won’t look at you funny, fatback is often used for sausages. As for the liempo, ask for pork belly, and fatty pork belly at that. GJO, no fennel and garlic are definitely not one and the same. For more info, I have previous posts on fennel. rachel, I think if the adobo is in a clay jar or garapon and completely COVERED in lard that solidifies, you can keep it several weeks on the kitchen counter. But with refrigeration, you might as well stick it in the fridge, where it will also keep for weeks/months. My dad used to cook this when he was still alive! And yes, he also cooks it in a palayok over wood/charcoal. We enjoy eating this with fried rice and tomato in soy sauce. We just get a little everytime since we’re trying to make the dish last long. Haaaay… Now I know how this is cooked. I’ll try it this weekend. Hello sir, my mouth just watered when I saw your cooked adobo. May I ask how does one prepare the palayok for cooking adobo? I have not tried cooking something in a palayok before. Do you just wash it properly then add the ingredients and cook it? Thanks. trgarde, how to season a new palayok, in this earlier post, here. Oh this must be the adobo my lola mentions in her stories. They would cook it in a big palayok and then keep it under the bed for months. The pork pieces would be redolent in fat. Every morning they would each take a small piece from the palayok, fry it and eat it with rice. They would even get more oil from the pot to drizzle over the rice. I just happen to have a small clay pot used mostly for braising Chinese dishes from Williams Sonoma with glazed bottom and found a good occasion to use it. Took the leanest cut of liempo and pork belly however and used a bit of olive oil to fry more garlic to add to the reduced broth. The bits and pieces from frying was deglazed and I took care of whatever remained in the frying pan sopping off the sinful goodness with left over rice and hoped even my guardian angel was not looking….all this at 10 in the evening! Wish I had bagoong. Ms. Connie C…you know the ka-partner of your adobo at 10 pm?..PICKLED GREEN MANGOES! I have already made 2 batches and they were supposed to sit for another 2 days…can’t wait…ate them all! It tasted the same and EXACTLY as I remember it when I was still a kid. Thanks for the updated recipe MM! Just checking in for a testimonial here. Tried the recipe a few weeks ago. Stove top and a deep kawali, teflon coated. The very best adobo I’ve had. And everyone at lunch also liked it very much, even though they were at first reluctant to try it after seeing the tender pieces of pork swimming in the melted liquid fat. Wasn’t able to try it fried because there wasn’t any left to fry! Oh, I also topped it with crispy fried chopped garlic (fried using some of the adobo fat). Yum! Will definitely try it again with your updated step-by-step recipe. And will try it fried. Anne, we ka-pampangan call fatback or soft fat “tapi”. When heated it yield a good amount of lard. Some culture use it to make pancetta or bacon. Em, I think pancetta or bacon typically comes from pork belly, not fatback, but I could be wrong on this… Glad several people seemed to have tried this recipe in various cooking vessels and it has worked nicely. This is definitely one of my favorite recipes. I just tried cooking adobo without soy sauce tonight. I used the stovetop as I had not read MMs post yet when I made it. Turned out awesome still. I couldn’t believe the golden color. I will serve it with salted eggs,patis,tomatoes and siling labuyo! Yum! Any truth to the rumors that cooking in a palayok is poisonous? 2.5-3 hrs, brother? But what about our other duties? joe, good things come to those who wait. Patience is a virtue. Slow cooking often yields incomparable results. :) If you cook it in an oven or stovetop, you can do your other “duties” at the same time. i tried the recipe using all the ingredients and even bought a new palayok. i also used it to boil water first before using it for the adobo. the adobo smelled perfect and i thought everything was ok until i tasted it after about 45 mins of boiling and it tasted bitter! i am not sure which of the ingredients did this to my adobo but i’m sure i followed each and every step you mentioned. i thought the fatback burned; but i only had a few burnt (browned) pieced at the bottom, but definitely not something that would cause the sauce to turn bitter. i tried to remedy it by taking the pork out of the sauce and boiling it again with datu puti vinegar but the damage has already been done. do you think it’s the coconut vinegar i used? it’s a fermented coconut vinegar from mama sita’s. 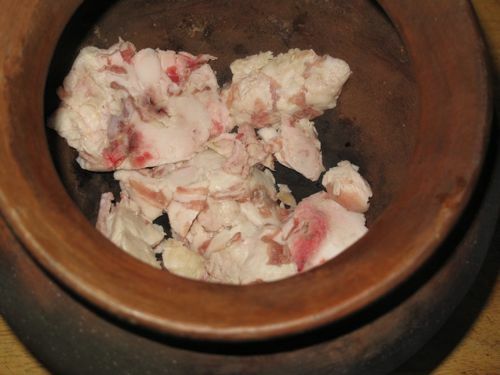 i won’t give up and will try again using datu puti. but what are your thoughts? cindy, hmmm, let’s see. The fat shouldn’t burn at the bottom at all. A sign that your fire was too strong at one point or another. I would NEVER suggest using datung puti vinegar. It isn’t a “real vinegar” in that it is probably chemically constructed. A natural cane or coconut vinegar is best. Mama Sita’s is also another questionable vinegar choice, though they do say it’s coconut vinegar, I am doubtful of its provenance, though that’s just a hunch, with no proof whatsoever. To me, the other possible culprit is the palayok. Was it glazed or not? I used plain clay palayoks, with no glaze, I prepped them by boiling water in them, or water and vinegar, and throwing the water out. Once you put the meat and vinegar, do not cover the pot and let the acids from the vinegar evaporate, then cover. Many folks seem to have been able to do the recipe with good results, so I hope you are more successful on your second attempt. Just remember to use good vinegar, fresh pork, fresh spices and natural (NOT IODIZED) rock salt. If you think it might be the pot, try it on a stove top first. And finally, the flames should be really gentle, definitely not enough to burn the pork. Drooling at this post – will try Liquid Smoke to replicate the smoky flavor. thanks for responding. what do you mean by glazed palayok? the one i bought is colored black. i wasn’t sure how to clean it but the man in the store did say to boil water in it first, which i did. then i threw the water away. yup, will definitely try again and hopefully it gets better. Cindy, I did NOT use a black palayok. Maybe that’s the difference. I am not sure how they make the palayok black, I hope it isn’t paint or some other chemical material. I know some folks say to use a black one, but I have always used a red one, that naturally turns black on the outside after you cook with it. black palayok, i think is just made of black clay. maybe there is an effect of the black clay compared to the tera cotta ones. this is the adobo i grew up with–sans soy sauce. some people call this adobong puti, we at home call this “lola’s adobo” because my beloved grandmother used to cook this for us. next time, you might want to try cooking it in a frying pan then make garlic fried rice out of the pork drippings. :) sinful! Tried to cook this with what i have available at home, 1.3kg liempo (country style cut), del monte cane vinegar, and a stainless pot. Used 1/3 cup coarse salt, but the adobo came out too salty. My guess is that the salt was not coarse enough so in effect i used too much, or the pork was sliced too thinly. Will try this again soon using bigger chunks of liempo and less salt, in a Crock Pot. Hehe, sorry about that, Marketman, I was referring to the Del Monte spaghetti sauce commercial tagline. The one with the Italian nun and the novices. cindy, did you move the pork around after you put in the vinegar? if so, this could have caused the dish to turn bitter. remember to wait for the acids to cook off before touching the dish as the improper cooking of vinegar can cause it to turn bitter. It is the authentic adobo recipe! some they call it adobong iloco/ilocano but it adobong puti or white adobo is more popular nowadays. Thanks MM, will try your recipe one of these days. Have to search for a palayok in one of the filipino stores to achieve the right taste and aroma. Hopefully one of the stores will carry palayok. Any suggestion on what type of pot to use as a substitute for your overseas readers? Hi MM. Is it ok to use Del Monte Red Cane Vinegar for this recipe? thanks! Hi again MM! Can I use “lola conching’s coco nectar vinegar” (featured in 2005) for this recipe? Does it have similar taste to the coconut vinegar that you use for your adobo recipe? Thanks! Thanks again MM! I really appreciate it :-) More success on your business! Where can I get garlic bulbs? I’ve never seen them. I always see garlic being sold in the markets. will slow cookers work with this? something like this: http://www.lazada.com.ph/Imarflex-Digitable-Programmable-Slow-Cooker-ISC-500D-11895.html? Kudos to the FOOD Magazine article, btw. can’t wait to go back to Cebu for zubuchon! also, hopefully you could update us if there are any gatherings (is it an annual thing?) you setup for mm fans and bloggers. Thanks! thanks Mr. MM for this post.I had tasted it few years ago and my dorm mate called it Adobong Puti because no soy sauce had been added.Its great and no “umay” effect.